A call to Michael White at Ocean Independence confirms that he's now closed on the sale of the 90.6m motor yacht Sunrise, a joint listing with Peter Thompson. Sunrise was built by Italy's Apuania yard in 1991. More of a mini cruise ship than a superyacht, she accommodates 120 guests and is Lloyds classed and SOLAS registered. Sunrise has a cruising range of 3,120 nautical miles at 11 knots and was asking €29.5 million. 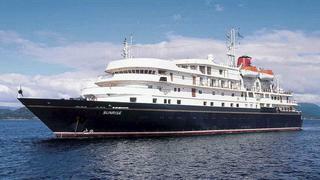 Mike tells me this is the second time he's sold her and she's now going back into commercial use as a cruise liner.